In addition, the researchers at the facility have world-leading experience in physical modelling using natural and surrogate vegetation including the use of nutrient-rich saline water recycled from the adjacent aquarium tanks to enable modelling of estuarine and coastal ecology. To maximise the output from experiments, the flexible physical modelling capability is coupled with a unique set of state-of-the-art instrumentation which enables high-resolution measurements of flow field characteristics, sediment transport dynamics and morphologies. 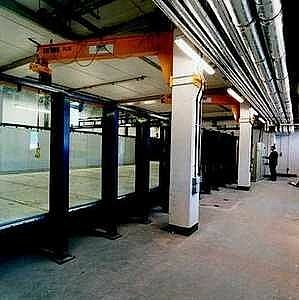 This flexibility therefore makes the facility ideal for investigating problems relating to climate change adaptation and is particularly suited to providing new opportunities for experiments to investigate the interactions between ecology and sediment transport dynamics under changing or extreme hydraulic conditions. Particle Image Velocimetry (PIV/PLIF): A unique system designed for 3D flow mapping of regions up to 0.4x0.3m in size. 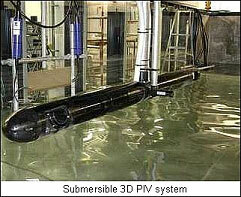 Measurements at up to 96Hz can be obtained using two submersible cameras and a pulsed laser. A 3D traverse system enables detailed mapping of flow volumes up to 1x1x1m. Vectrino Doppler Velocimeters (ADV's): An array of 5 Vectrino probes can also be used to obtain velocity profiles. A range of probe designs enable measurements near surfaces and in confined areas. These can be supplemented by 6 ADvs. Acoustic Doppler Current Profiler (ADCP): Larger areas of flow can be quantified by a profiling ADCP, which measures the 3D flow field in vertical profiles at up to ~0.5 Hz. Pressure Sensors: A pressure sensors array provides spatially distributed water surface elevation data. Acoustic Rangefinders and Acoustic Backscatter Profiler (ABS): Twelve URS probes can be used to quantify the detailed morphology and spatial and temporal evolution of subaqueous surfaces. ABS allows for continuous measurement of vertical suspended sediment flux and bed elevation for continuous measurement of erosion and deposition using three acoustic backscatter probes. Sediment Size Measurement: On- and off-line measurement of sediment size using laser-diffraction and/or an image analysis system which also measures particle shape. Morphology Scanning: Digital elevation models of exposed surfaces can be obtained using a high-resolution laser scanning. This can be used to create time evolution maps of erosion and deposition. Imaging: Digital cameras including a submersible unit for monitoring bed morphology and time-lapse imaging for monitoring long-term surface evolution. 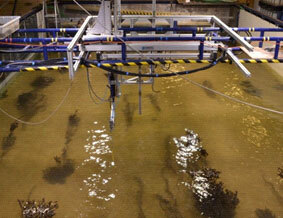 Sediment Feeders: Automated sediment feeding for sand-sized sediments. Sediment Trap: Measurement of bulk sediment transport rates at end of test section.